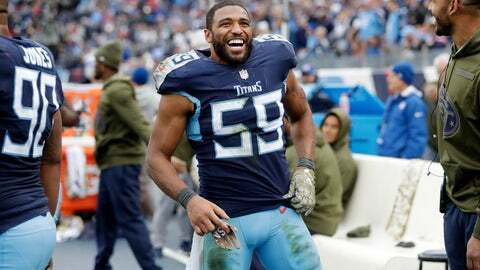 NASHVILLE, Tenn. (AP) — Wesley Woodyard laughs when asked if the 32-year-old linebacker has found a fountain of youth. He sets the tone for the NFL’s second-best scoring defense, a unit that has taken a big leap in several statistical categories this season under first-year head coach Mike Vrabel and coordinator Dean Pees. Woodyard, also switched to a vegan diet last year , is surrounded by youth at inside linebacker with Jayon Brown in his second season, 2018 first-round draft pick Rashaan Evans and six-year veteran Daren Bates. Woodyard is leading the way with 72 tackles, and he’s tied for second on the Titans with 3½ sacks. He also has five tackles for loss as the Titans (5-5) prepare to visit Houston (7-3) on Monday night. Notes: The Titans went through a walk-through practice Thursday, taking advantage of an extra day before their game in Houston. QB Marcus Mariota was limited with an injured neck, and Vrabel says they will test Mariota’s arm Friday because they didn’t throw much Thursday. WR Taywan Taylor (left foot) and C Ben Jones (shoulder) also were limited. RB David Fluellen (knee) did not practice.